Benoy’s Green Design for High Speed Rail in Taiwan. 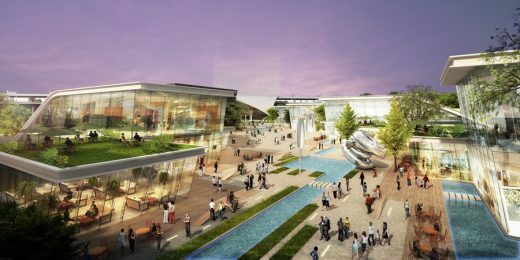 Benoy, international award-winning Architects, Masterplanners, Interior and Graphic Designers, has unveiled the design for Taiwan High Speed Rail’s (THSR) Hsin Chu Station Mall. Presented at the February contract signing for the scheme, Benoy has revealed a green architectural design that melds into the landscape of the site. THSR appointed Benoy to conceive a low density retail project which would also deliver a green environment to benefit the community of Hsin Chu and surrounding residential developments. Following the current trend to create more diverse and vibrant transportation hubs, the development will be built on a 30,000m2 site directly connected to the Hsin Chu High Speed Rail Station. Wisely Suen, Senior Associate Director at Benoy explains, “The North-East angled plots act to mitigate the windy climate and we have drawn the landscape up to the roof of the low-rise retail buildings to create multi-functional green spaces”. “The three-dimensional retail experience has essentially preserved a large portion of the landscape for the users. The green slope design will be accessible from ground level and transformed into outlets for dining, restaurants and entertainment. The landscaped scheme will also feature an amphitheater and eight cinema houses alongside the retail offer”. Benoy’s design has prominently featured environmentally-friendly initiatives to support THSR’s green vision. Sustainable building materials, sun shading, green roof insulation, rain water collection, grey water recycling and solar power have all been integrated into the design. 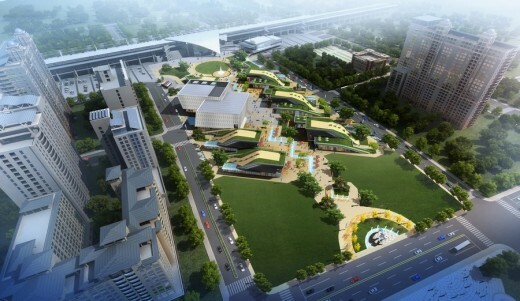 Sarah Lee, Divisional Director at Benoy commented, “Hsin Chu Station Mall is set to become a green icon for the city. The development really is a strong example of how to integrate the environment with commercial design to deliver viable and inventive spaces which enrich the lifestyle of our communities”. Hsin Chu Station Mall adds to Benoy’s growing presence in Taiwan which already includes the completed Megacity scheme in New Taipei and the future multi-purpose sports facility, Farglory Dome, in the capital.